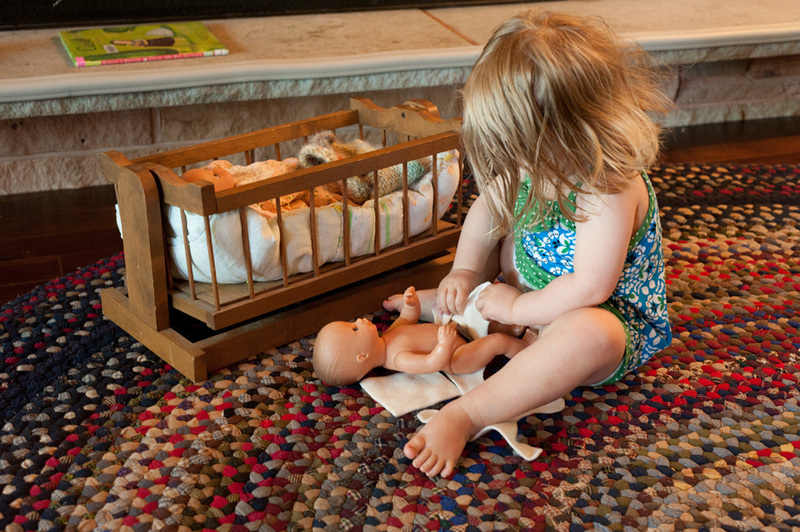 Our daughter just turned 2 yesterday, and she loves taking care of her dolls. 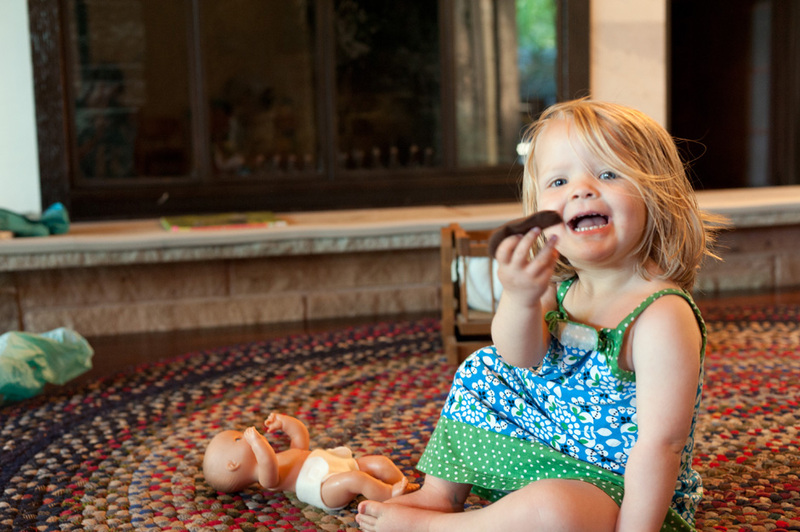 And like many other kids her age, she’s also pretty fascinated with poo. So when I was at the sewing machine a few days ago, I couldn’t resist making some doll diapers with detachable velcro poo. Yesterday morning I gave her the present. She was very delighted and surprised by the toy, and sat down to change her baby’s diaper over and over for the rest of the morning with a big grin on her face. Nice! 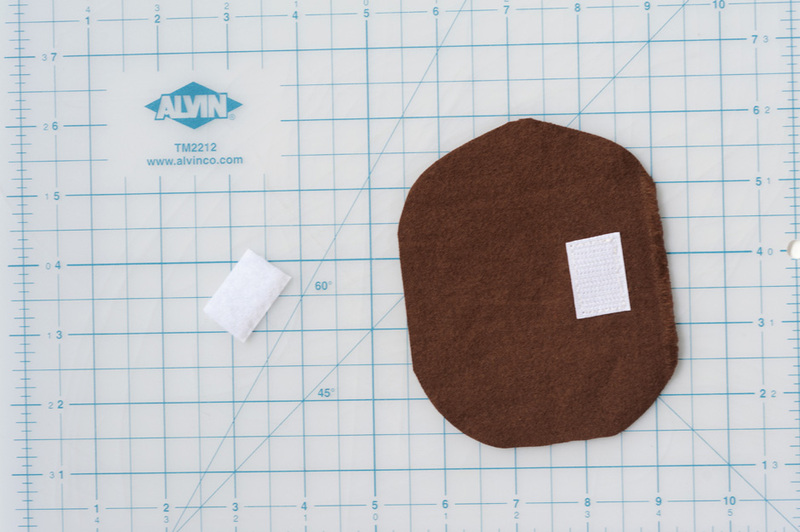 I wasn’t sure if I should post a tutorial on the site, but everyone on the Facebook Page said yes, so here are some instructions below, complete with printable diaper template. I used fleece for my diaper, so its very easy to make. Not much sewing at all. 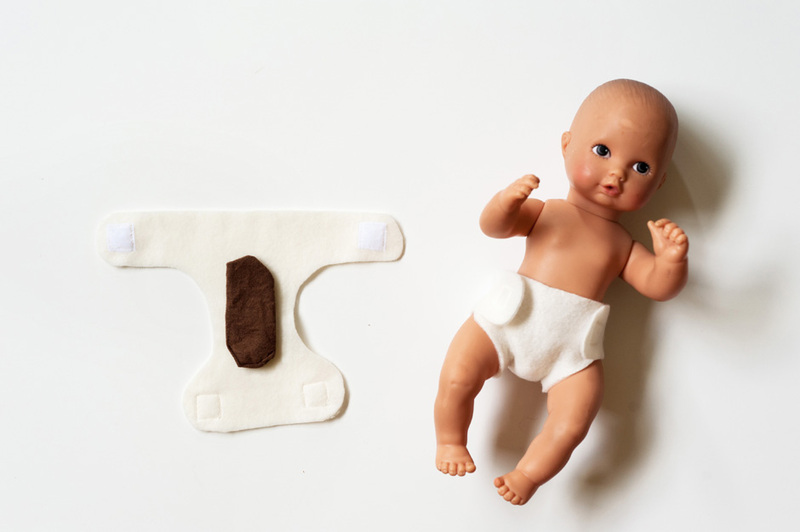 Also, keep in mind that you might have to adjust the size of the diaper template depending on the size of your doll. 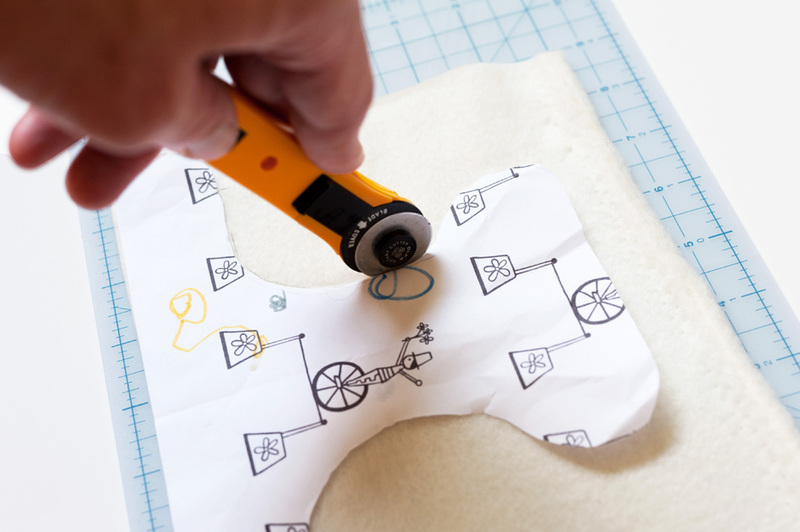 Print out the template at the bottom of this post, and cut out the pattern. (Recycle some old paper if you’d like.) 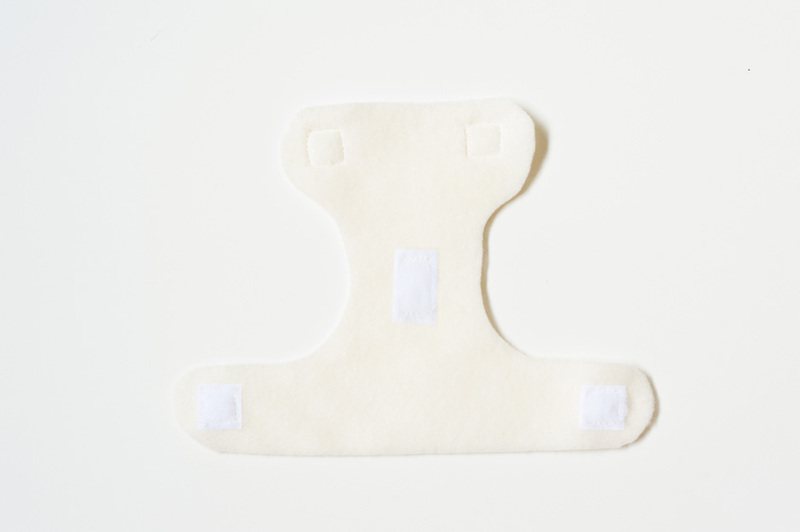 Then place pattern over a piece of fleece (or felt) fabric and cut out the diaper shape. 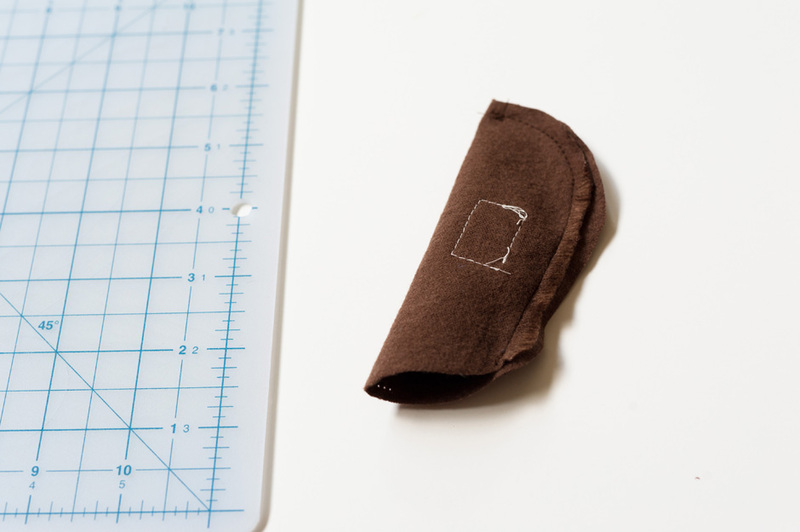 Using the photo or template for a guide, sew on the pieces of velcro for fastening the diaper and also the poo. 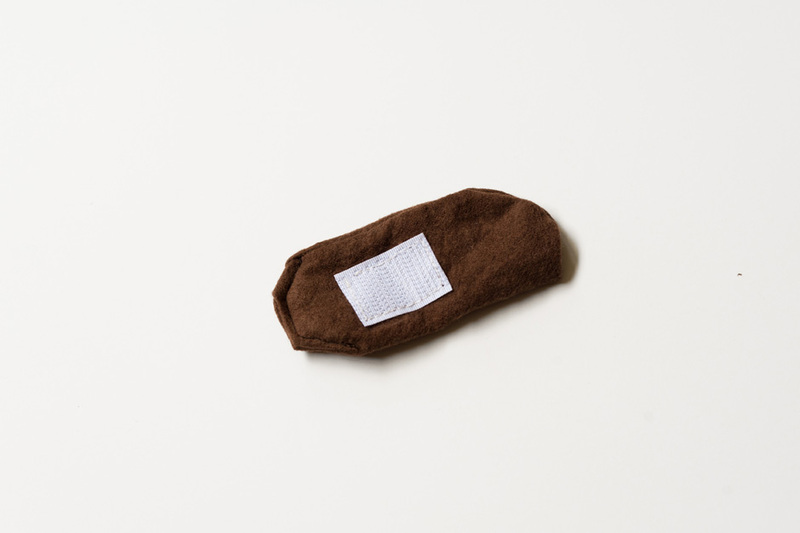 Now find some brown fabric scrap, and cut into an oval shape, about 4.5×3.5 inches. Then sew a piece of velcro onto one side. (See photo.) Make sure the velcro is opposite that on the diaper, so the velcro attaches. 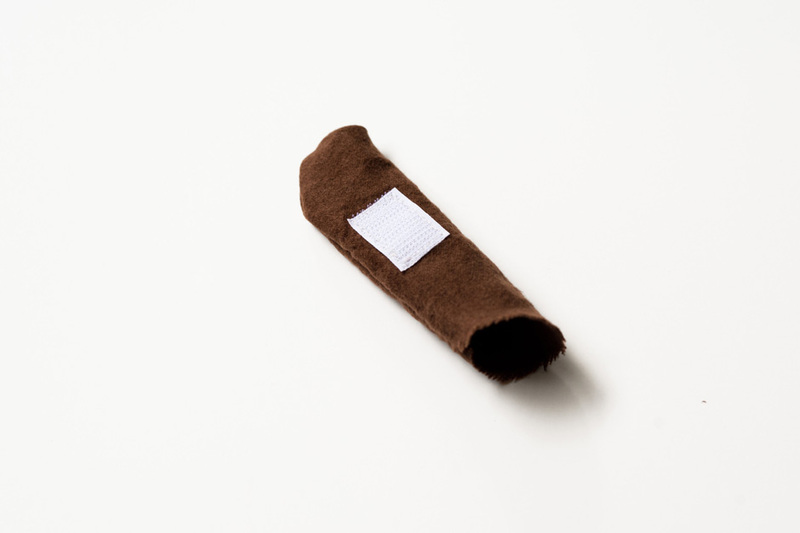 Fold the oval in half length-wise so that the velcro is inside and sew down the edge, leaving an opening at the end. Tuck in the fabric on the open end, then sew it closed, and attach it to the diaper. Oh, and I also cut a square shape of fleece for her to use as a wipe, which added to the excitement. omg why didn't I think of this? I am always about the simple gifts that kids really like and that are homemade. thank you and I will be giving these to all of the two year olds I know!! Thanks for this great idea! I saw the link on Facebook this morning and promptly made on for my 2 1/2 year old's baby diaper. 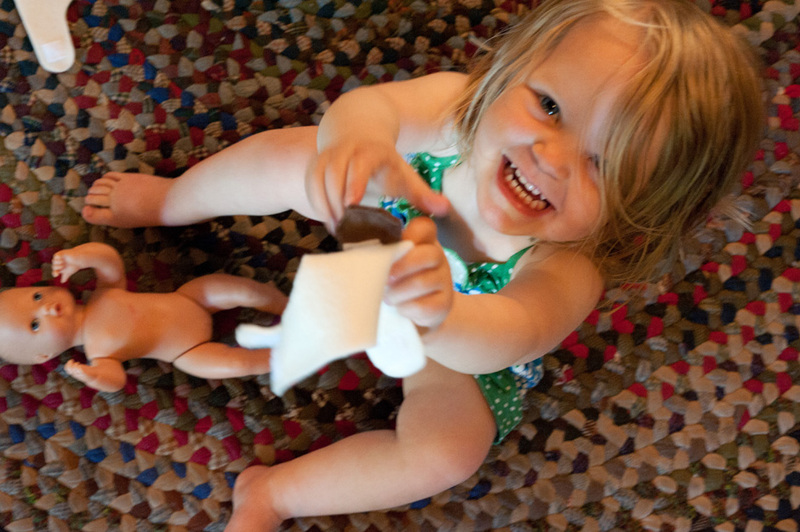 She and her older brothers have had a hilarious time playing dirty diaper! I'm hoping it will help overcome her resistance to pooing in the potty herself. Cheers! I have to tell you that this cracks me up. I made some doll diapers for my daughter recently and my husband and I were laughing about making some pretend poop and sneaking it into the diaper. And you actually did it! Love it. that is so funny that it has fabric poo! 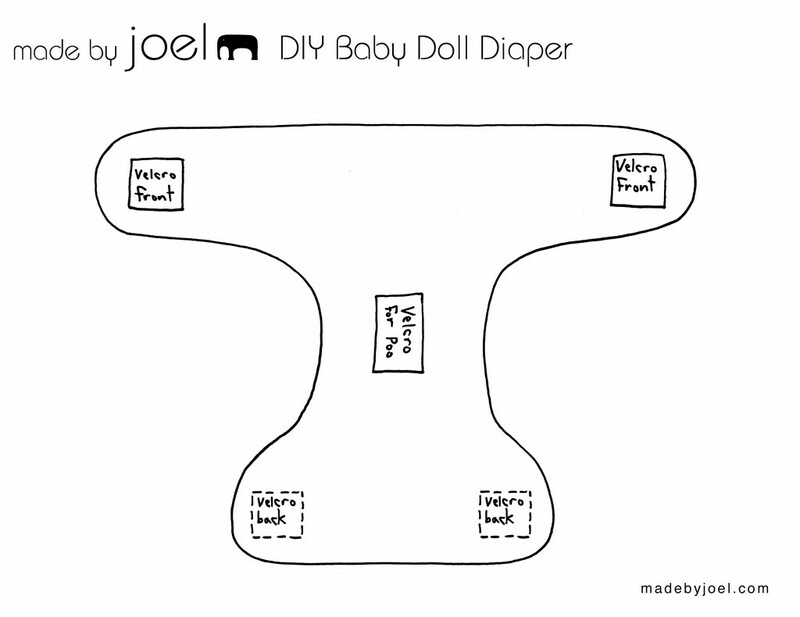 i'm really glad you posted this tutorial, because i've had it in the back of my mind to make some diapers for my daughter's dolls, but i wasn't sure how to... thank you! Ha, thanks everybody! Yeah, this was a pretty wild one, but she loves it! Totally great, Joel!!! I know a few little-littles who would LOVE this! Oh my goodness, that is genius! Like everything you do of course (seriously, you have the best brain!). My kids might be too old for this but I am totally making it anyway just to see their faces. LOL. Brilliant! How about a yellow 'pee' puddle too? Perfectly ew! My son loves it already. Oh I'm so glad I've just discovered your blog. This is just about the most brilliant thing I've ever seen. My three kids were all fascinated with the contents of nappies and my youngest is still at an age where I can see hours upon hours of entertainment for her. Thank you! What a clever idea! My son is now potty trained (hooray! ), but would have loved using this as a learning tool. Hi Joel, these were a bit hit with my 2 daughters(ages 2 and 4). I even made the pee puddle as someone else suggested. My youngest even held the poopy diaper like it was the real thing in the beginning!! Thanks for the great idea!! Well, the poo is sure funny. A sure hit with any kid! ha. yeah, it's still going strong. my two year old loves playing with it. Thanks for this great idea! I had to laugh at myself for making this! I actually made 2 diapers in different size for 2 dolls, and my 2-year old daughter just LOVES them! Oh good! Glad she likes them! Yeah, It's not the classiest toy, but sure does entertain the kids! I made 10 sets of the nappies, wipes, wees and even made chocolate brown leather poo (as I had lots of brown leather and no brown felt) as gifts for the kids at the playgroup I take, I've heard from all the mums and apparently it's a universal hit that's getting played with, thank you, you're a star!! Ha, awesome! I bet that was a surprising gift. Cool! Thanks Heather! Yes, the doll is one of those that come with a bottle and potty. I just did a search and I think it's the Emma Drink-and-Wet Bath Baby Doll.